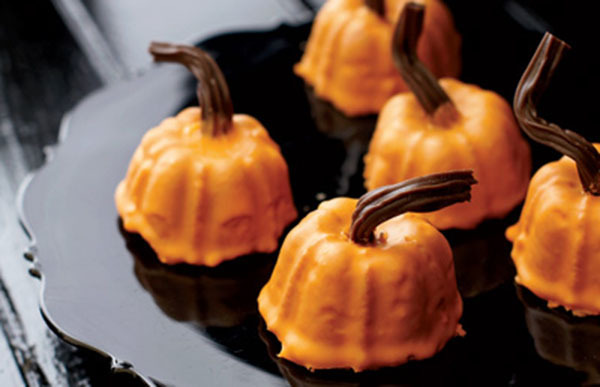 Make the mini pumpkins: Preheat the oven to 350ºF and coat a 12-cup mini Bundt cake pan with vegetable cooking spray. In a small bowl, whisk the flour with the pie spice, baking powder, baking soda, and salt. In a large bowl, using a hand held mixer, beat the butter with the granulated sugar at medium speed until fluffy. Beat in the egg and vanilla. Add the dry ingredients and the sour cream in 2 alternating batches. Spoon the batter into the prepared Bundt cups. Bake in the center of the oven for 25 minutes, until the cakes are risen. Let cool slightly, then invert onto a rack to cool completely. Make the glaze: In a bowl, whisk the sugar, butter, and water. Stir in the food coloring until it’s a pumpkin shade. Pour the glaze over the pumpkins, spreading it gently to cover them completely; let dry. Stick a licorice piece on top of each cake to make a stem. Recipe makes 1 dozen cakes.